Since I started running as a kid, I’ve been running along the River Tyne. Whether its was the iconic Great North Run following the River from Newcastle to South shields, racing my brother around the loop between the bridges at Wylam and Newburn, or just running into the office, the river has been a big part of my running live. So it pretty much stayed as just that a crazy idea that I’d never do much about. Until one day I was looking on the internet at upcoming Ultras and spotted a new race called the Tyne Ultra, a two day untra following the course of the North or South Tyne to Hexham where the rivers join on day one and then from Hexham to the coast on day 2. At first I thought ‘hey they’ve stolled my idea’, then I thought ‘hang on I could enter the day 1 of the race and just not bother to stop after day one, just keep on running to the coast’. 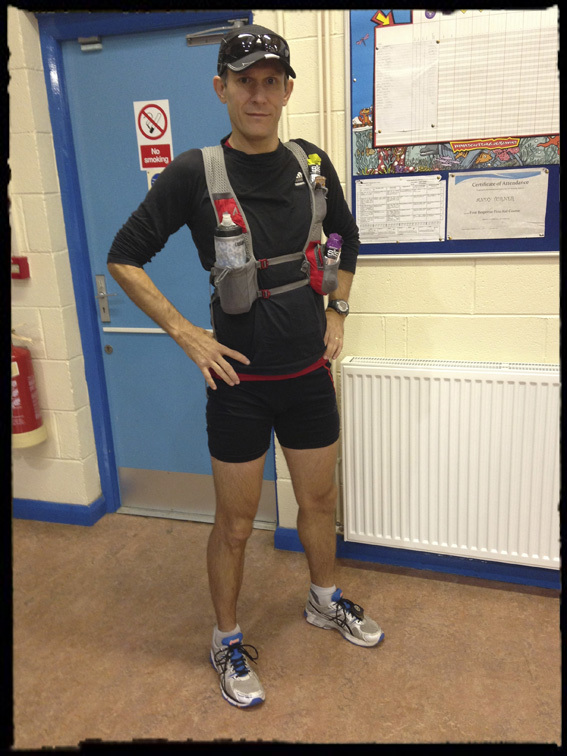 I had ran longish distances unsupported in the past, reccing 20 miles of the Lakeland then turning around and running back to the car, I’d also ran far long races, but I’d never ran through the night without support having already ran 40 miles. Unsure what the organisers might think of my hijacking their race to do my own thing on saturday night, I sent them an email asking if they would have any problems with me doing it that way. After crossing the finish line on day one, I would would be entirely on my own, running unofficially, there would be no checkpoints, if I got lost it would be down to me to sort out myself and even if I finished my time wouldn’t show in the results. As race day got closer, there were worryingly few people signed up to run, and more disturbingly the organisers didn’t seem to be responding to queries on their website’s forum or to my emails. With a only a couple of days to go, I went ahead and signed up. At that point there were 14 other people on board, 1 running the North Tyne, 9 South Tyne and 8 running on Sunday. As far as I knew I was the only one planning on running all the way threw. Most Ultra’s are quite formal affairs, having published routes with cut off times for each checkpoint and mandatory kit list that all runners must carry at all times, many races having pre race kit checks and even weigh ins. The Tyne Ultra was a little different there was no mandatory kit, it was up to runners to take what they saw fit to take, with less than 24 hours before the race started I’d not received any details of the exact route, where the checkpoints would be, what food would be available or even exactly how we’d get to the start. I been told I’d receive the final details my email before the race, and as promised they did eventually arrive at 2.30am on the the day of registration. Registration was even more informal that the race communication, it was at the Scout hut, next door to Marks and Spencer in Hexham behind the hospital. When I walked into the hall the organiser Jon, was sat at a desk with a laptop and a pile of a4 print outs of Os maps while 2 other guys were standing around chatting. Jon Asked me my name and continued to chat, it turned out the guys were also runners come to register, one was running the North Tyne by himself on Saturday the other running the hexham to Tyne Mouth section on Sunday only. During the course of the conversation I discovered that there would be one marshal covering the North Tyne Course and another 2 covering the South Tyne, driving on to the next checkpoint as the last run left hoping to arrive ahead of the front runners as they went. After about 10 minutes I made my excuses and drove back hope to grab some dinner before making any last minute kit changes and heading to bed. I had a few butterflies in my stomach as I lay there trying to sleep, i felt like this was the least prepared i’d ever been for a run, yes my bags were packed for the run, for the one and only checkpoint on the second half and for the finish, but because I had no idea about what food would be available where until the last minute I’d overlooked getting a couple of things I usually take like peperami (very good for salt intake on the run), I’d also not had as much sleep as I would have liked and I still didn’t have a map showing the route. Four thirty came quickly, and before I knew it I was up and dressed, had had some breakfast and was driving with Lucinda to Hexham for the start, when we got there a couple of people that had slept there over night were packing up there gear and others were putting on trainers or checking their kit. Lucinda took a couple of photos and said bye before heading home while I wait to be taken up to the start, the transport turn out to be the marshals cars. The Start was a small car park on the moors above Alston, the closest that the road gets to the source of the Tyne about 2 miles away. There was a slight chill in the air, with the sun not yet high enough to provide much warmth, the the skies were blue and clear, so it looked like we were in for a glorious day. It was still 10 minutes until half past when the race was due to start, but Jon the organiser said he wasn’t going to keep us standing around in the cold needlessly and we head off. Within minutes I was ankle deep in water, just what I was looking to avoid after foot problems in the Lakeland 100. 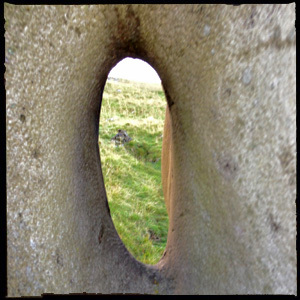 You couldn’t see the source or the stream that would become the River from were we were but we’d been told there was some sort of sculpture or rock to mark the spot, so it should be easy enough to find. There were a couple of different route options, follow the fence the longer way around, cross the ups and down of the peat haggs or try to skirt around them, and it seemed we’d all take a slightly different tack. After a few minutes I consulted the map , and soon got to a point were it seemed right to turn down the slope toward the valley bottom, apparently it was a good estimate as we emerged right on the source. 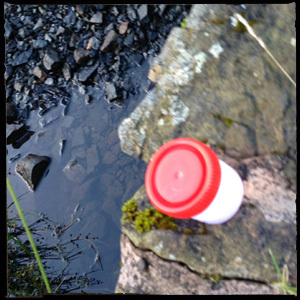 I stopped and look a few photos, and filled a small container of water which I popped in my bag and would carry until I emptied it into the sea at the end of my journey. This was an idea I’d got from a friend called Jacqui Schulz. Jacqui is an Australian film maker who’d made a charming movie with some indigenous australians documenting their journey from the source of a river to a lake at its other end. Appropriately enough I met Jacqui several years earlier when she worked on a project to build a bamboo bridge across the river on the Newcastle | Gateshead Quayside – but that is a different story. It was quite surprising how quickly the trickle of water coming from the spring became a stream, and how quickly that small stream became more substantial. Within only a few miles you could only cross the stream via a bridge. The first few miles passed quickly following the South Tyne Trail down along a section of path which became a track and then a road before crossing a small footbridge and becoming a muddy track through the fields. Up until the footbridge all of the runners had remained in sight of each other, but as the terrain became more difficult I found myself in a group of four runners that were starting to break away from the others. 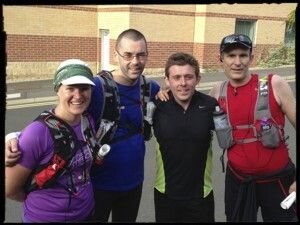 I didn’t know it then but the four of us would remain together for the remainder of the day until the finish in Hexham. Carrigill was the first little village we got to and the location for checkpoint one, we spotted Jon before spotting Alistair but were soon gathered around the open boot of the audi topping up water bottles, grabbing bags of crisps, cheese sandwiches and glasses of coke, before heading off again towards Alston. 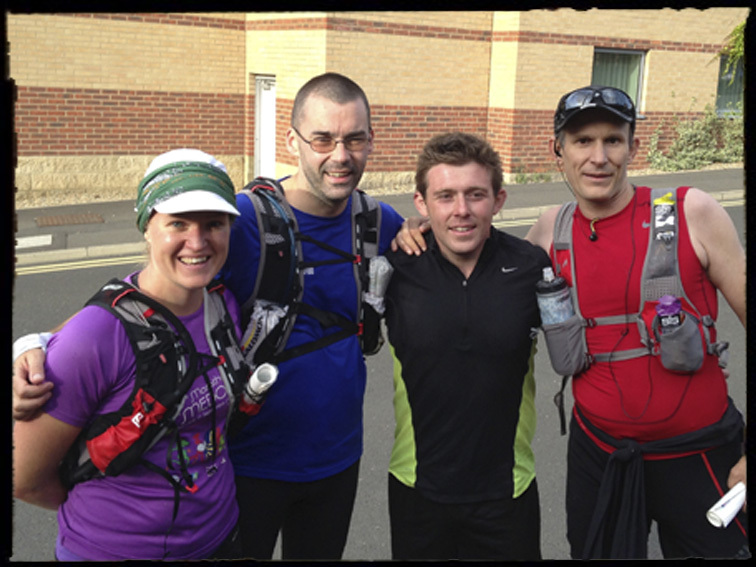 Even at this point only having ran a few miles with Claire, Simon and Gavin and only having seen Jon and Alistair at one checkpoint, it had the more the feeling of a reccie or a day out running with friends that a full on Ultra race. 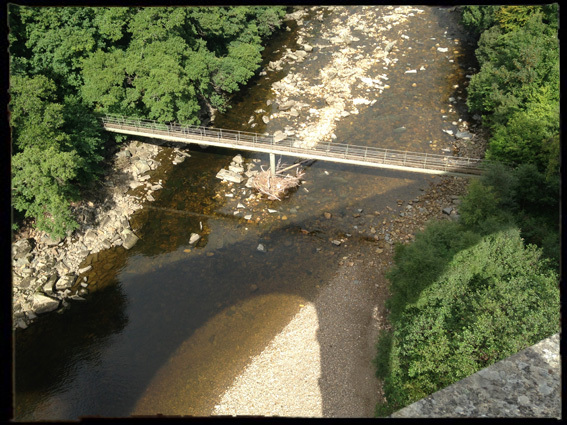 The route didn’t stick strictly to the South Tyne trail, but instead followed a variety of different paths sometimes along the river, over bridges, under tunnels, through woods and fields and occasionally on roads or tracks. It was perhaps a little convoluted in places, but it was a beautiful day, and the variety of terrain meant we got to see plenty of wildlife from birds of prey to snakes as well as lots of sheep,calfs and the odd bull and I was in good company, even if they did insist on running even the hills (something I don’t often do on Ultras). This was one of the first races I’d done in a while where I needed a map. Both Simon and I were both checking our maps as we went and while we did missed the odd turning, between us we were pretty much able to correct any errors and get back on course quite quickly. Given that I was still planning to run on to Tynemouth after getting to Hexham, I was probably going way to fast and not eating quite enough, but I was pleasantly surprised to still be keeping up with the lead group at this point and starting to entertain the idea of a joint first place. I know there were only 9 runners so its not like winning a proper race, but never having won a race in my life it was quite a novel idea. While the route could quite easily drop straight down to the river, it look us instead over Lambley Aqueduct and then back again over the footbridge underneath, by this time the Tyne its quite some size and the bridges crossing it have began to become more impressive. 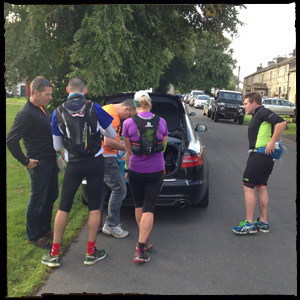 As we got to the checkpoint at Haltwhistle there was quite a gap developing between our group and the remaining runners who’d split into two couples running separately with Jon a little further behind after taking a wrong turn. When he arrived at Beltingham, there was no sign of a checkpoint so we continued calling in to say that we’d just push on to Haydon Bridge and catch the marshals there. 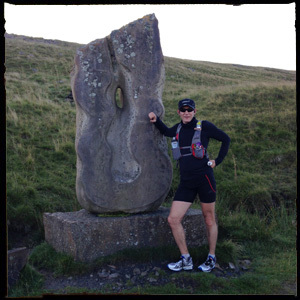 I was now far more familiar with the area having ran sections of the course on the Haltwhistle marathon and the Wall Race, and happy to run without needing to look at the map quite as much at all. While I still had many mile to go, it was great to finish the race together as a group and get a few photos before stocking up on water and heading off n the next chapter of the adventure on my own. Unfortunately the maps and the road books that I’ve been only went as far ax hexham, and the maps and road books for day two had still not been printed. So I was going to rely upon memory, to cover the day 2 route, and as it happens they had changed the route from that route published on the internet, so I didn’t run exactly the same route that the others would follow in the morning but it was close enough. Now that I was on my own I switched from listening to music to listening to an episode of the British Trail Running Podcast and adopted a strategy of walking for five minutes in every 30 in order to conserve a bit of energy and water. Lucinda was going to meet me at Prudhoe with some supplies, but then there would be no further checkpoints until the finish. I pushed on as best I could while it was still light, slightly altering the route to avoid the run through the woods at the back of hexham where I’d potentially get lost without a map, rejoining the route at Dilson and returning to the river around Corbridge from where the track literally follows the river bank through the woods to riding mill, at this point the North and South Tyne have merged and its quite wide. Even the streams feeding into the Tyne start to become quite large and at one point I had to cross a fantastic set of concreate stepping stones. It had taken around 3 hours to get from Hexham to Prudhoe and in actual fact the Sunday runners would follow a slightly different (flatter) route into Prudhoe on the other side of the river, having changed from the version of map on the website a little. I was really looking forward to seeing Lucinda, we had been texting a bit as I ran, so she knew where I was and how I was doing. We arrived at the car park by the station at exactly the same time and I climbed into the car seat and sat drinking a lemon tea and changing my socks, the double pairs of socks thing was just not working the outer pair was simply trapping water in the inner pair and my feet were remaining wet all day despite my trainers drying – something to sort out for next time. I fueled up on rice puddings, crisps and bananas eating like a mad man. Then I swopped my water for black current, got out the head torch and tied another hoody around my waist before kissing Lucinda good night and goodbye and thanked her for coming out with the supplies, then headed out into the night along the next stretch or river. The first few miles left great I was back to running a little faster and not walking as often, but as I passed Wylam and started to run along the river side walk, the lack of sleep started to get to me my eyes getting heavier and heavier, at times I swear I actually nodded off as I ran, waking with a start, opening my eyes relieved to see the track still stretching out in front of me. I still had around 20 miles to go. I began to wonder if i’d make it all the way to the coast, thinking about the possibilities of calling it a day at Newcastle, i’d have covered 100km and I could always finish the rest in the morning with Gavin and the others. Previous races had been far tougher. 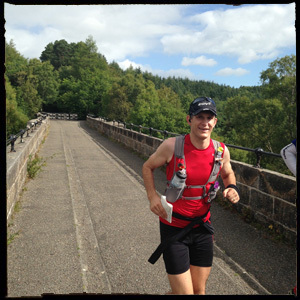 I’d kept going in the Wall, the Northumbrian Ultra, Cotswolds, Hardmoors 55/60 and the Lakeland 50/100. But this was no longer a race, there would be no medal or t-shirt at the end and I was running on my own so the temptation to simply stop was far higher. But I wasn’t running on my own, I was getting motivational text from Lucinda encouraging me to keep going. She knows me better that I know myself, telling me how much i’d regret it if i gave up now having gone so far. So I kept going. Someone had thrown themselves off on of bridges in the town centre and there were police helicopters, fire engines, ambulances and rescue launches searching the river as I jogged past at around one in the morning. The other thing keeping me going was that little container of water i’d collected at the source of the river, I kept thinking about what i’d do with that if i simply went home. Would I tip it into the Tyne there, would I leave it in the jar or put it down a drain. No there was nothing for it put to keep going until i reach the sea and could put it where it belonged. Tiredness however was not my only problem, I was also starting to feel sick, I’d obviously not quite got my nutrition right and while feeling I needed to get some energy from somewhere I couldn’t even stomach drinking. Chuppa chup lollies were usually my secret weapon if i could eat anything else I could manage one of those, but tonight I could even do that, I gagged every time I tried to put it in my mouth and ended up walking with a lolly in my hand for a couple of miles. Eventually I reached a sign on the number 72 cycle path that said Tynemouth 8 miles. I was down to single numbers and felt that deserved starting to run again. The next miles passed reasonably quickly and it wasn’t long before I was texting Lucinda to arrange to be picked up at the finish. I’m not entirely sure where the official finish of the Tyne Ultra is, but i’d arranged for Lucinda to meet me at the Tyne mouth Metro station. I guess I could wrap things up by saying thank you to Lucinda for giving up a nights sleep to support me and getting me through it, to Gavin, Claire and Simon who were great company for 40 miles and to the organizers and Marshals jon, Alistair and Jill for putting on the event, providing great support at the checkpoints and an interesting route, and finally to Jacqui for the carming movie that gave me the idea for carrying the water from the rivers source to the sea. Generally I try not to write stage by stage, stride by stride blog post, partially because there a lot of other people out there that are very good at writing those (and after all that’s really what the road book’s there for) but also because i’d end up writing vanity posts name dropping friends and going off on my own little eco trips of what amazing guy I am. They have a tendency to go on almost as long as the run itself. I made an exception with this case firstly because so few people ran this race its unlikely there will be many accounts of it (and a few people asked if i’d write a post) and secondly because I couldn’t come up with a better way to write about it after all its was a run along a long and winding river with a start and an end and a meandering bit in the middle. This entry was posted in food, gear, motivation, planning, racing, routes, social, technique, training, ultra. Bookmark the permalink. Great write up and blog post. A good read David. Well done! great read David, sounds like a big mental effort to remain focussed on the final stretch. Great read Dave, the weekend had seemed like a blur, until I read and reminisced my way through your blog. Great effort to do it in one go! Great write-up – I thought about entering this one – might give it a shot next year. I run the Wylam-Scotswood section every now and then, so can picture you passing through there at midnight – bet it was atmospheric.